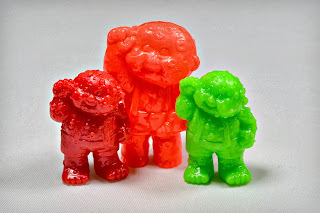 Little Weirdos: Mini figures and other monster toys: MiniKins: New Garbage Pail Kids mini figures! 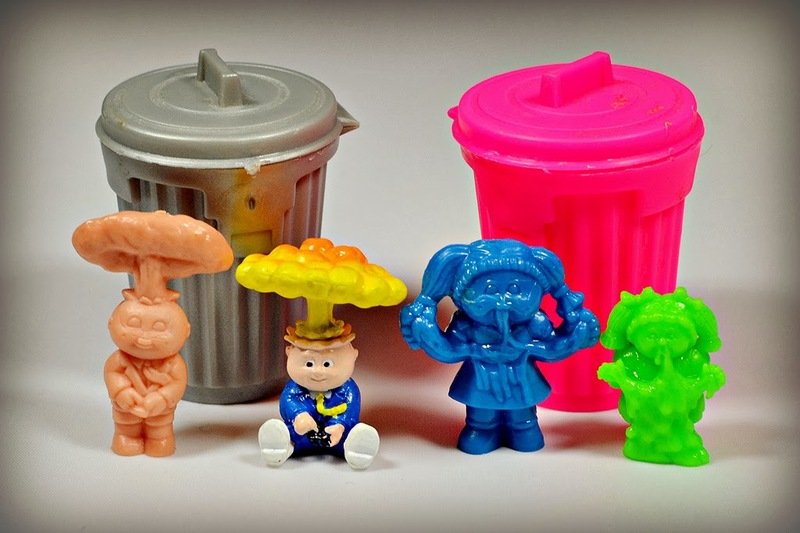 MiniKins: New Garbage Pail Kids mini figures! WHAT: They're here! 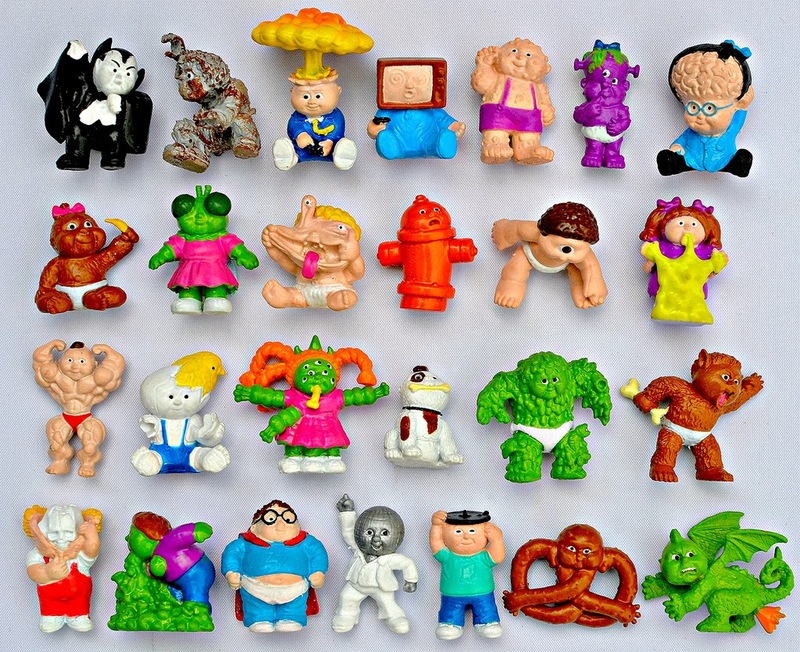 Announced in the Spring of this year, MiniKins are the first official mini figures of characters from the popular Topps Garbage Pail Kids trading card line since the "Cheap Toys" of the 1980s (which were plastic monochromatic minis sold with "Crummy Candy"). Garbage Pail Kids fans and mini figure collectors had been asking for new GPK toys for years, so the announcement that MiniKins would be hitting the shelves later in 2013 was met with much excitement and anticipation. There are 26 different figures in MiniKins Series One, each one representing a character from a GPK trading card. Each figure comes in five main versions: a base painted version, as well as blue, red, green and yellow unpainted, monochromatic variants. Blue and red figures come 1:3 packs, green 1:4 packs, and yellow is the least common with 1:12 packs. Once the toys hit store shelves, people also began finding rare, unannounced monochromatic black variants of the figures. Special one-of-a-kind gold MiniKins have also been announced as prizes for upcoming fan contests surrounding the toys. 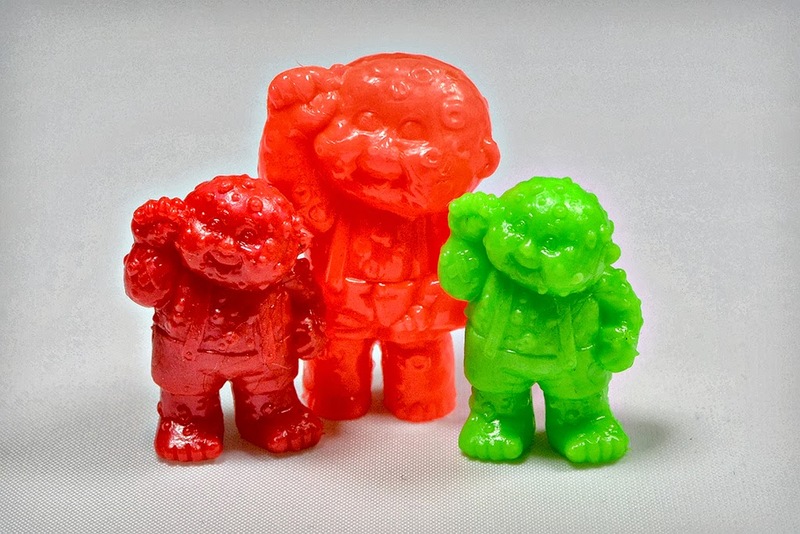 MiniKins are made out of a squishy, soft rubber material (think just a bit softer that Monster in My Pocket figures, but not as soft as other modern minis like The Trash Pack or Squinkies). with one painted figure visible in the package and three figures hidden. 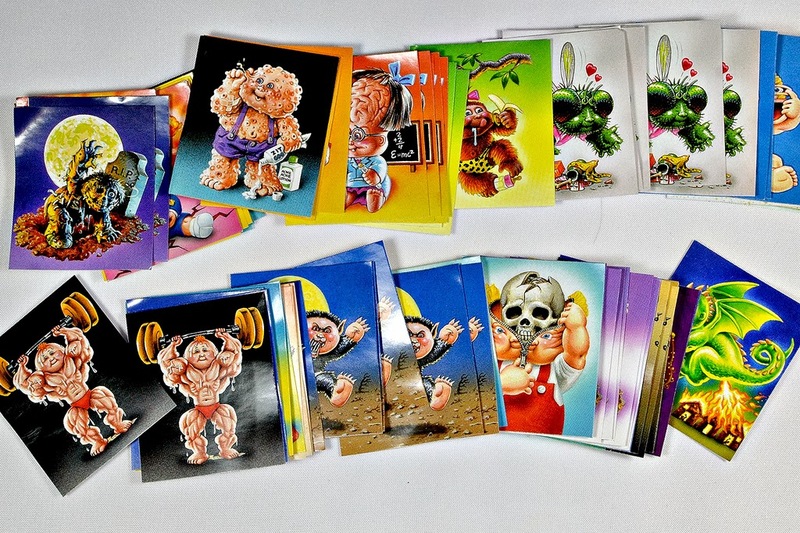 Each figure is packaged with a sticker featuring GPK card artwork of the respective character on the front, and humorous character bios on the back. MiniKins are around 1", so a bit smaller than the old GPK Cheap Toys. Now that we've got the basics covered, I've got to say...I'm pretty much addicted to these! I think Topps really got it right with MiniKins, for a number of reasons. First, the fact that MiniKins are produced in both painted and monochromatic versions. 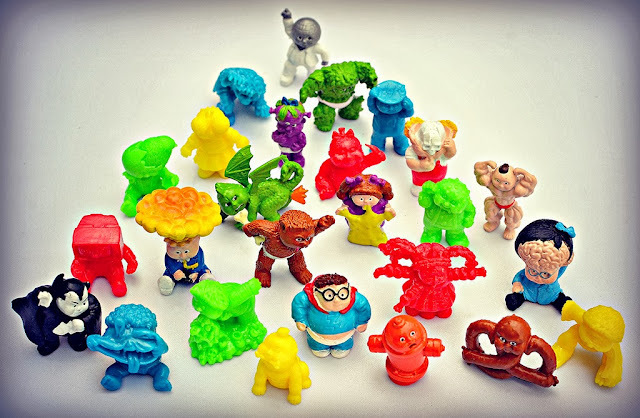 Mini figures that are popular with kids these days tend to have painted details, but many older collectors prefer mono color figures reminiscent of classic lines such as MUSCLE, Monster in My Pocket, and of course the GPK Cheap Toys. By producing both painted and mono figures, Topps is catering to everyone's tastes while at the same time making the line even more collectible by offering so many variants. I always prefer monochromatic mini figures and in this case it's no different, but it's nice to have the painted versions, too. I'm also really happy with both the sculpting and the material of these figures. For the very small size, they are very detailed and represent the GPK card artwork well. To add to the appeal, the soft rubber has a great feel and is really fun to squish between your fingers (but at the same time it's not overly soft). I'm a big fan of the character selection, too. A lot of the most popular Garbage Pail Kids from the classic early card series are accounted for, such as Spacey Stacy, Leaky Lindsay, TV Stevie, Dead Ted, and the most iconic GPK of all, Adam Bomb. There's also some newer characters thrown into the mix such as Fiery Francis the fire-farting dragon and Salty Sean the pretzel. Finally, I love how there's some cool promotion being done for MiniKins, such as a fun series of short episodes posted to the official MiniKins channel featuring the figures in funny situations, and a MiniKins Facebook page. It's nice to see that things are being done to generate even more excitement. As someone who's been wanting new GPK toys for a long time, I really couldn't ask for more from MiniKins. I can't remember the last time I was this excited about a mass-produced toy series. If you would have told me last year this line would be released--and that it would launch with two series already planned, offer both mono and painted variants, and be made out of an awesome rubbery material--I probably wouldn't have believed it. I'm really hoping MiniKins prove to be a massive hit with kids and older collectors alike, and that we'll see many more series to come. WHEN: The first series of MiniKins first appeared for sale in stores in October 2013. A second series is planned for release in Spring 2014. WHERE: Currently, MiniKins are available at Target and Wal-Mart stores, as well as to order online. MiniKinds can be found in stores in sections where trading cards and other blind bag toys are sold, plus in some cases pegged on endcaps in toy sections. WHO: Produced and released by the Topps Company, the creators of the Garbage Pail Kids trading cards. Whoa momma! I must have these! I never had any GPK figures as a kid, but I wish I had. Now I have a chance to pick up some figures! You really captured these little guys well, bravo! Thanks Mason, glad you liked the post! Yes, it's exciting to have GPK figures back in stores! Thanks, Justin! Hopefully once we compare lists we'll have ones the other needs and can work out a trade. The Question is: Where can i buy online the Little Weirdos releases!!!???? NICE WORK!! Thanks! Some of them (like MiniKins) are still available in stores in the U.S. Others that I post about you can usually find on eBay or buy from other collectors on toy forums like littlerubberguys.com.